We hold our backpacks to the same high standards as everything else we review and buy, and while we'd like to pick a "best backpack," we know it's impossible to make one pick that fits everyone's style, budget, body type, and carrying needs. So we've highlighted a few of our favourite laptop-backpack models and brands: bags for the workplace, a jack-of-all-trades, a weatherproof commuter, and a single bag for work and the gym. This post was done in partnership with Wirecutter, a buyer's guide to the best technology. 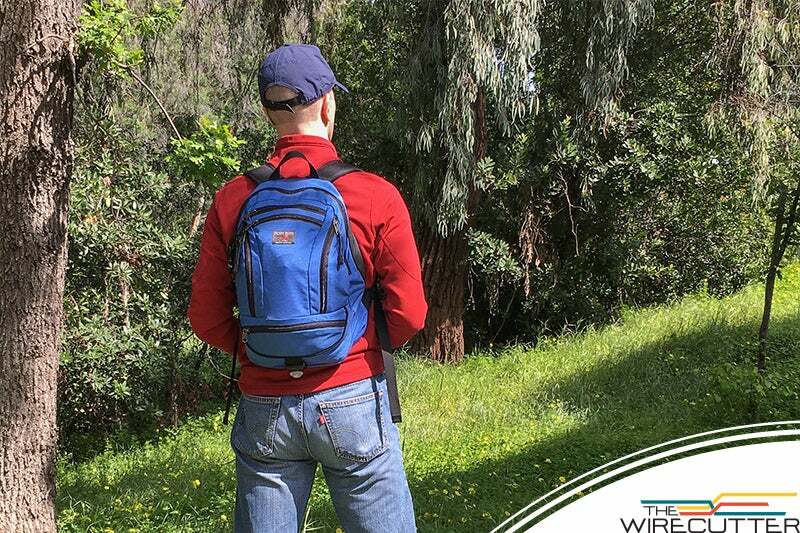 This is a condensed version of Our Favourite Laptop Backpacks; read the full review here. After testing hundreds of bags over many years, these are the ones we would personally recommend to our own friends and family. We've focused on bags that cost less than $US250 ($332) because if you spend more than that, you're almost guaranteed to get something good. It's more about what fits your personal style. 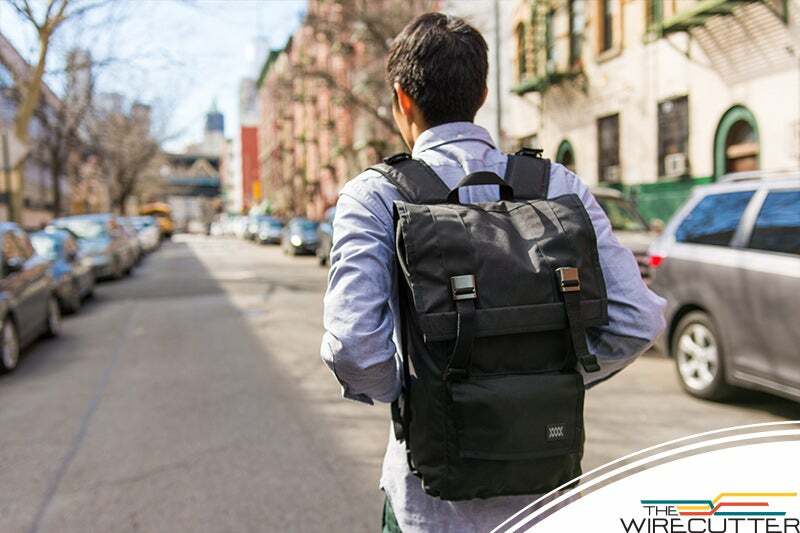 Check out our full review of our favourite laptop backpacks for more styles, including alternative options for each pick. If you work in an office with a business-casual dress code and need a bag that won't make you look like you just came from a college campus, the Incase Icon fits the bill. It has a refined design that looks good no matter how much you put in it or what you wear it with (including a blazer), pockets to fit an entire home office, and ergonomic features — like a sculpted back panel and adjustable yoke straps — to make it comfortable enough to wear for an extended period even when totally full. Organisation is the Icon's strength. By our count there are 21 different pockets and sections, which sounds overwhelming, but they're thoughtfully placed to give you easy access to things that tend to get lost in larger compartments. Wirecutter's cameras editor Tim Barribeau packed it with a 33cm MacBook Air with power supply, an iPad, an iPhone 6, lightning cables, Apple's larger USB wall wart, a camera, a notebook, pens, headphones, wallet, sunglasses, moisturizer, keys, a Zojirushi travel mug, and a gadget organiser loaded with an audio recorder, a portable USB battery, USB cables, memory sticks, and SD cards. Even with all of this there was room to spare and everything was easy to find and access. The Incase Icon's strengths in design also lead to its biggest flaws — namely a fit that won't work for everyone and a surprising bulk. Icon's clean lines necessitate a fairly rigid outer structure. That means that it doesn't get any smaller when it's empty — and as you load it up with all your gear, you may be surprised at how heavy it is when you lift it. Furthermore, even the best padding won't make up for a bag that won't sit on your body right. The shoulder straps, while comfortable on a 6′2″ tester, are not for everyone. A 5′2″ tester found that it hit her neck uncomfortably high, hit her lower back awkwardly low, and was too wide. There's not enough room for adjustment to substantially shift it. The Incase Icon Slim is an inch narrower and less deep due to its lack of a separate laptop compartment, so it may be a good alternative if the normal Icon's shoulder straps are too wide. If you want one bag that can do it all and you don't mind a more outdoorsy look, the Tom Bihn Synapse 19 is a jack-of-all-trades that also happens to be a master of most. Despite its unassuming appearance, it has enough organizational features to keep your gadgets and gear in their places, but it won't weigh you down with pounds of unnecessary material and superfluous style. It's versatile enough to be used as a commuter backpack, a daypack, a casual-hiking pack, or an everyday bag. 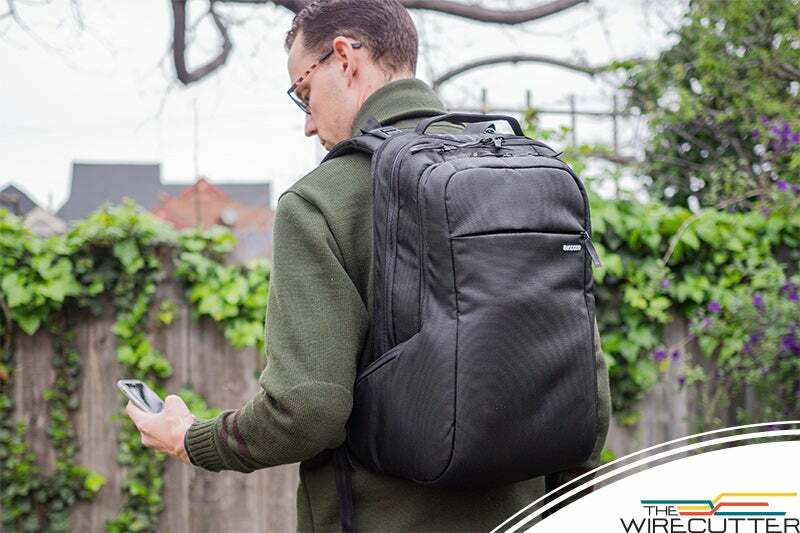 Senior editor Dan Frakes has used the Synapse 19 for nearly six years as his primary laptop bag for commuting, carry-on bag for flying, and everyday bag for hauling gear for himself and his kids. Other than the expected visible wear, its CORDURA exterior and YKK zippers are still just as good as when it was new. Though the Synapse 19 is comfortably compact, its large, divided main compartment can hold a surprising amount of gear and includes attachments for up to two of the company's padded Cache laptop and tablet sleeves (up to 13 inches). Left and right exterior pockets can each hold an item such as an umbrella or sunglasses, along with pens, business cards, and other small items; a small top pocket is perfect for a phone or wallet. We also love that it has a water-bottle pocket in the middle of the bag's exterior so it doesn't make one side of the bag heavier than the other. A wide pocket at the bottom of the bag can hold a rain jacket, a travel umbrella, a small food container, or a bunch of kid supplies, and the outside of that compartment sports a strap for a clip-on light, so motorists can see you when you're biking or walking at night. For even more pockets, Tom Bihn's Freudian Slip fits snugly inside the Synapse and provides a nifty two-sided organizational panel that you can slide out without removing its contents. For more capacity, Tom Bihn offers the Synapse 25, which is the same design as the Synapse 19 but offers 30 per cent more volume and can hold larger laptops. 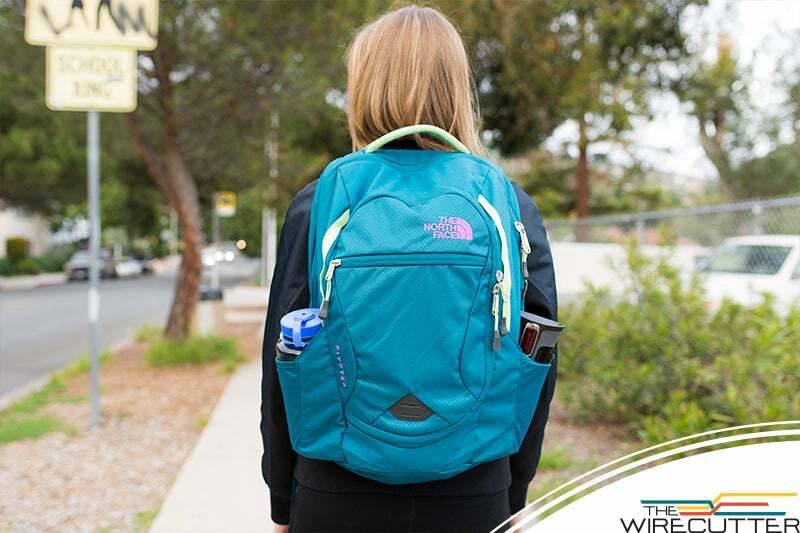 The Synapse isn't the most eye-catching pack, but it's lighter (by a pound or more) than many "stylish" packs. And it's more expensive than many nylon backpacks, especially if you add the price of a Cache sleeve for your laptop or tablet and a Freudian Slip organiser. However, Tom Bihn's quality and design are top-notch, and you get a lifetime warranty. Even better, you may never need to use that warranty. The Mission Workshop Sanction is as sleek as it is tough and resists water from all angles, which makes it perfect for bike commuters and people who live in rainy climates. But commuters of all varieties will appreciate its slim profile that lets you squeeze through crowds, and its ability to overload in a pinch to accommodate the winter jacket that, in retrospect, you really didn't need to wear today. The Sanction is everything a modern rucksack should be: simple, rugged, and comfortable. Don't be deceived by its scant 20-litre capacity. Its fold-over closure system — secured by a combination of plastic buckles and Velcro — expands naturally when unfolded to accommodate overloads and slims down when there's not much stuff in it, with no additional compression straps required, which makes it a much more elegant solution compared to the cinch-cord or roll-top designs found on many similar bags. The fold-over design also provides extra water resistance to the handy external pockets that are good for keeping essential items within easy reach when secured. It hits the sweet spot of having just enough features and ergonomic touches (like a mesh-padded back panel and shoulder straps) to be an everyday pack, without going overboard and spoiling the simplicity of the rucksack design. Wirecutter editor Michael Zhao has used the Sanction for four years, and in addition to using it as his daily commuter (bike crashes and all), he's taken it on trips to three different continents and it still looks as good as new after a good scrubbing. In fact, if anything, the Sanction is a bit too tough for its own good. At 1kg empty, it weighs a full pound more than the similarly sized, but much more fully featured Tom Bihn Synapse 19. Much of that weight comes from the heavy-duty waterproof liner, which is invaluable for bike commuters, but is overkill for walking around town. Its integrated laptop compartment could be better thought out too. It lacks padding of any kind and you can't access your computer without opening the whole bag. But overall, it's a stylish and rugged pack that offers a lot in a simple-looking package. Many laptop/gym bags focus on just the laptop and gym parts of the name but forget about the little things that you need throughout the day, such as pens, cables, and earbuds. The North Face's Pivoter (for Men and Women) solves this by putting a fully featured laptop bag with an integrated sleeve and organiser in the compartment closest to your back, and a cavernous, duffle-like compartment on the front that swallows clothes and shoes. So while your work and workout stuff are kept separately, they still carry together harmoniously. At 27 litres, this bag easily fit a pair of women's size 7 running shoes, socks, yoga pants and top, and a full-size towel in the front compartment. And the two exterior side pockets are handy for stowing a water bottle and an insulated coffee mug — most laptop/gym bags only have one such pocket. Plus, coming in at under $US100 ($133), it's a great value, especially when you factor in the reliability of The North Face's lifetime-warranty coverage. The Pivoter is available in both men's and women's models. 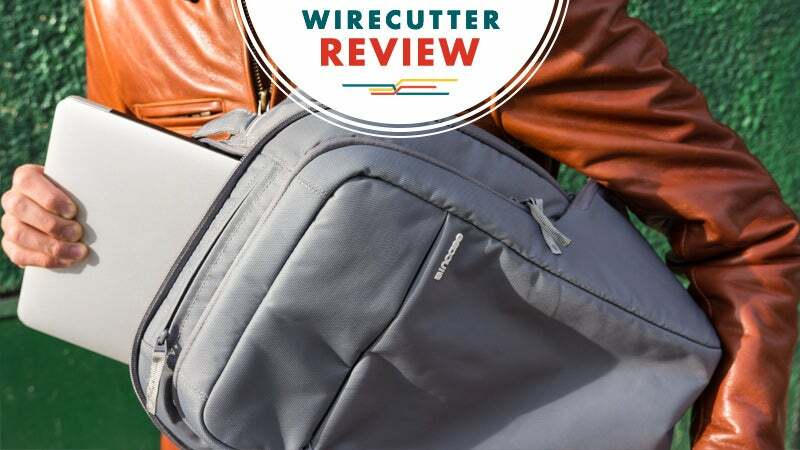 Wirecutter editor Erica Ogg found the women's version the most comfortable of the backpacks she tested, even when fully loaded, thanks to the adjustable chest strap and the thick, cushy straps contoured in the right places. The padded back has an air vent running down the center to help prevent back-sweat buildup too. The otherwise comfortable Arc'teryx Cordova noticeably lacks the chest strap and air vent. That being said, the Pivoter is not the sleekest-looking bag in this category. The colour scheme of the one we tested would be a little casual for some professional settings, but The North Face offers plenty of colour combinations, including basic black on black. The bag's polyester material is also not waterproof or even water-resistant. And while we would have liked to see a bungee for attaching a yoga mat like you'd find on the Tom Bihn Smart Alec, a series of webbing loops on the front mean you can add your own if you want.